Bob Dylan’s mysterious motorcycle accident in 1966—an event that has provoked all sorts of wild speculation—gave the overworked mercurial star an opportunity to become a full-fledged recluse, which he seemed to need, whether it was warranted by his injuries or not. He skipped out on Woodstock, turned his back on the flower power rock scene, and in 1967, recorded what I consider his absolute best album, John Wesley Harding (go ahead and yell about my tastes in the comments). By 1969, he had recovered enough musically to expand his palate and record my second favorite of his albums, the full-on country Nashville Skyline. 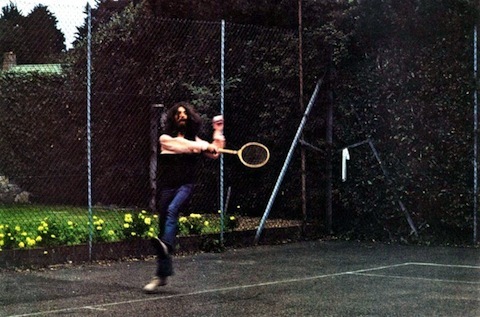 He had also recovered enough physically to play tennis with George Harrison, as you can see above. Harrison, meanwhile, had quit The Beatles in January, then was coaxed back into the band, which more or less broke up later that year. But he had been busy—recording two mostly-instrumental solo albums and writing his Hindu gospel hit “My Sweet Lord” and the rest of his incredible 1970 triple album All Things Must Pass. 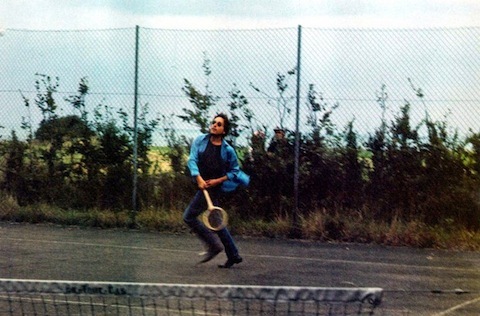 Somehow amidst all the turmoil and transition, as Harrison began his most productive solo period and Dylan prepared to release what nearly everyone considers his worst record, Self Portrait, the two found time to hit some balls before Dylan’s performance at the Isle of Wight festival. Dylan was apparently a longtime tennis fan. His 1964 “I Shall be Free No. 10” contains references to the sport. The photos were released by the Harrison family for the 2011 Martin Scorsese-directed doc George Harrison: Living in the Material World (trailer below). Kind of surprised you mentioned Harrison’s “My Sweet Lord” without referencing the plagiarism suit it inspired. I finally got around to looking into it — learned that the song he borrowed from is called “He’s So Fine”, recorded in 1963 by The Chiffons (you can listen to it here: http://youtu.be/rinz9Avvq6A). The similarity of the melodies is unmistakable. Which is not to suggest George Harrison wasn’t a talented songwriter … just a brief observation, plus an excuse for wondering why suits of this kind weren’t more frequent. Rock-n’-roll songs, after all, are plentiful and tend to be melodically simple. Well, everybody’s younger than someone. I was 8 in 1963 … so no, I wasn’t listening to Top 40 music on the radio. As for “Sue You Sue Me Blues”, thanks for the reference — I listened to it over on YouTube. I guess the guy who wrote “Taxman” was never more inspired than when he was pissed off about someone having a hand in his pocket. After Harrison’s lawsuit, which he lost, he bought the rights to “He’s So Fine” so he couldn’t be sued again. One thing I never understood about pop song copyrights cases: if they have any validity at all, Chuck Berry would be richer than Bill Gates. I don’t think John Wesley Harding was Dylan’s best, but I think very highly of it and listen to some of it frequently to this day. I like it much better than most people do, I guess. Most of us, when JWH came out, were blown away, got Nabokovian spine-tingles from it. I also loved its radical turn away from ever-more-outrageous/complex acts of psychedelia. So it was also a press of the reboot button, very liberating for the music scene. Picking a favourite Dylan album is a bit of a fools errand – hell these days I am likelier to listen to Love and Theft than any of the other records – but John Wesley Harding is definitely a joy from start to finish.